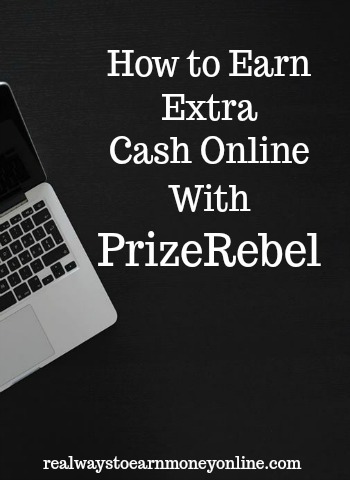 PrizeRebel is a site where you can earn rewards, including gift certificates and cash, by completing small tasks and earning points. The site is well established with a great deal of content and a very slick design. Like most services of this nature, it's not a huge money-making opportunity, but it's a decent way to kill a few minutes when you have nothing else to do. My first impression of the site, after spending some time going through their offerings, is that they're way above average compared to most similar services. Below I'll go over a few more specifics and explain why I think Prize Rebel is potentially well worth your while. There are a huge number of methods for piling up points through this site, including taking surveys, watching videos, and engaging with companies by participating in various product offers. There are also little jobs you can do in their “Task” section, such as drawing boxes around retail items and categorizing products, which remind me of Amazon mTurk assignments. Out of all the possible ways to earn, the survey offerings are by far the most extensive. Once you sign up, you'll find numerous links at the top of the homepage, all leading to long lists of surveys from different opinion gathering companies on a variety of topics, including many that I thought were fairly interesting. This is definitely not a site where you'll log in and fail to find any tasks to keep you busy. It's basically overflowing with content. If surveys and videos aren't your thing, there are also contests you can enter, and if you refer other people to the site, you get a share of bonus points for all the tasks they perform. Who's Eligible to Use PrizeRebel? There are no restrictions mentioned in the FAQ. From appearances, pretty much anybody can sign up with this site and start earning points. Based on the current rate of exchange, the points are worth exactly one penny each, which was convenient because it makes it very easy to know how much actual money you're earning. You can exchange those points directly for cash or you can use them to purchase various types of rewards. Cash-out options at PrizeRebel include Paypal, direct bank deposit, and bitcoin. You can also get gift certificates, game codes for well known subscription-based titles like World of Warcraft, and gift codes that let you purchase video games for popular consoles. Some rewards even allow you to claim items directly through retailers like Amazon. How Many Points Can You Realistically Earn Per Week? It's hard to say for sure, but you could probably earn a pretty huge number if you were willing to spend a lot of time on the site. Within my first hour I had already earned over 100, and I was still trying to get a feel for how much everything was worth. With sites like this one of the keys is to show up consistently, so that you don't miss out on the highest value tasks. You'll also need to learn what will get you the most money for your time, and try to keep your overall schedule in mind. When do you have a few empty hours with nothing to do? Those are the best times to spend a few minutes, or an hour, doing tasks and accumulating points. Maybe you'll log in while drinking your morning coffee, or maybe you'll spend some time doing surveys during your lunch break. What do People Say About PrizeRebel? This site is heavily trafficked, so I found tons of reviews on Survey Police, and was able to get a broad picture of the overall opinion among users. The majority of the comments were very positive. There are plenty of people out there who use this site as their main rewards platform. Users love the amount of content available, the high point to dollar ratio, and the payout speed; apparently it usually only takes about an hour, which is really, really good in comparison to some other similar sites. There were also more than a few negative reviews, mostly people angry because they had trouble qualifying for surveys due to demographics issues, along with several who lost valuable time because bugs led to server disconnections in the middle of a task. There were also a few people angry because they got banned. It seems the company are very strict about certain things, and if they get any sense that you're trying to game the system by answering questions randomly, they'll dump your account in a hurry. As far as the bad reviews go, the people probably do have legitimate complaints, but generally sites like this will attract a disproportionate number of angry reviews. Mostly because people who are highly satisfied are less likely to take the trouble to comment than people who are angry about something. So in cases like this, where the positive reviews greatly outnumber the angry ones, it's probably safe to assume that the dissatisfied people are actually an even smaller percentage than they seem to be. Overall I would say that this site passes the feedback test with flying colors, but you may find it difficult to qualify for certain surveys, which is really the fault of the companies conducting the research – groups like Nielsen for instance – rather than Prize Rebel. Also, if you decide to try this site, make sure to answer your survey questions carefully and honestly, otherwise you might get hit with the ban stick. If this seems like the kind of site you'd like to check out–and if you're a fan of survey sites, it probably is–then go here and create an account to begin earning. You can also check out more reward sites we've written about if you're not sure PrizeRebel is a fit for you. Good luck! Hi there, as soon as I woke up this morning and saw your email I opened an account with prize rebel and started trying to find surveys and non were available or I didn’t qualify. I spent about one and a half hour clicking and filling out information over and over and every time the surveys said the same to me. Also, when I click on a survey, it seems like it’s a survey to be able to qualify for the actual survey which seems like a waste of time. I am a stay at home mom of a toddler, who is in charge of many of the purchases/decision making on my household so I don’t understand why I don’t qualify for anything. Maybe they have very specific demographic needs that I don’t fit into but I just felt bummed. Thanks for your feedback and I’m sorry you’re not finding PrizeRebel to be worthwhile. Those types of opportunities, while legit, aren’t something everyone enjoys. If you’re in search of something for extra cash that could be a little more lucrative for your time spent, you could try doing some website usability testing instead (if you haven’t already tried these) – https://realwaystoearnmoneyonline.com/website-testing/ That links has 12 different sites, and I’d recommend signing up as a tester on all of them to increase your opportunities to earn. Good luck! Thank you Anna, I’ll check it out tonight!